It doesn’t matter if your goal is getting out of debt, saving up for a purchase or simply balancing your chequebook. The best approach is to establish a monthly budget. If you are new to budgeting, the prospect of establishing a budget and then adhering to it in your daily life can seem a little daunting. 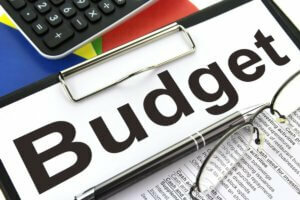 Here is some guidance on how to set up a budget and how to stick to it for the long term. “You’ve heard that budgeting is a great tool, but do you really know why? It can help you stick to your plan day in and day out if you are aware of and focus on exactly what your budget is doing for you,” says Jeff Schwartz, Executive Director, Consolidated Credit Counseling Services of Canada. Do you want to learn more about how budgeting can help you get your finances on track? Call us at 1-888-294-3130 or get started with our free online debt analysis. When you are in debt, you often feel like your life (and your finances) are out of control. Establishing a budget gives you back that control. Budgeting can also alleviate your debt stress because it reassures you that you have a plan and again, that you are in control of the direction of your financial future. “Budgeting also provides a framework for your saving and your spending and it is the best way to help you consistently spend within your means. This means that you’ll be able to manage debt and stay out of financial trouble moving forward,” says Schwartz. Working from a budget helps you define and focus on your goals, which can be crucial when trying to follow a a financial plan over the long term. One of the most common reasons for marital problems is arguing over money. Budgeting even plays a valuable role in helping with your relationship. A budget is a great visual tool that is an excellent starting point for conversations. By referring to your budget, you can communicate effectively to your spouse and likely reduce conflict around money. To start, collect all of your financial information and lay it out on the table. For your budget to be effective, it has to be comprehensive and accurate. Now that you’ve got a handle on your expenses, list your monthly income. If you are a part-time or hourly wage employee, take an average of three months’ income for budgeting purposes and estimate on the low side. Allocate your monthly income into three categories, fixed expenses, flexible expense and discretionary expenses. You may have to move things around and cut back in some areas. Although it will vary depending on an individual’s situation, one rule of thumb when budgeting is following the 50/30/20 rule. 50 percent of your income needs to cover essentials (like your housing, food and transportation); 30 percent should go to extras (i.e. entertainment) and 20 percent should go to debt payments and savings. If your monthly income is stretched very thin with your current expenses and spending habits, start by cutting back (or eliminating altogether for the short term) your ‘extras’. You can also try to reduce some of the variables in your monthly budget, like how much you spend on groceries, transportation and utilities by being proactive in finding ways to save. If you are carrying a lot of debt and your debt payments are eating up a lot of your monthly income, you may want to explore other ways to reduce those payments and balance your budget, like debt consolidation or a debt management program. You can pick any kind of system to manage your budgeting, as long as it works for you. You can go old school and use a pen and paper and cash in envelopes for spending. You can use a simple spreadsheet. If you are so inclined, there are a number of free (or low cost) budgeting apps that can help you stay on track and achieve your financial goals like YNAB (You Need a Budget) or Mint.ca. Whatever system that you choose, it is essential that you track your spending as you go along. It is the only way you’ll know for sure if your budget is working and if you are staying on track. This also helps you to identify areas for improvement. A working budget isn’t a one-time thing; setting a budget and sticking to it is a lifestyle change, for which you may need to shift your attitude towards spending. It can be challenging to always keep to your budget, but here are some tips for success. Make your budget the priority over everything else; build in “rewards” to your budget when you reach milestones; be patient with yourself when you get off track and commit to being better; remind yourself of your goals by putting visual reminders in high traffic areas in your home. You need to accept from the outset that your budget is dynamic and should change it as needed. You may have been too aggressive in your budgeting categories, or perhaps your expenses or income has changed. Either way, you should expect to revisit your budget once a quarter to fine tune it, or sooner if it appears that your budget isn’t working. Some signs that indicate that your monthly budget isn’t on track include credit balances continuing to climb (perhaps you are relying on credit to cover expenses, or your debt repayment strategy isn’t effective); your debt stress persists, even with a budget in place; you find it impossible to stick to your budget and feel like you’ve failed every month; you are still living paycheque to paycheque; you haven’t been able to accumulate any savings. Be open to changing your budget and don’t be afraid to seek professional guidance to set up a budget that works. Are you ready to take control of your finances? 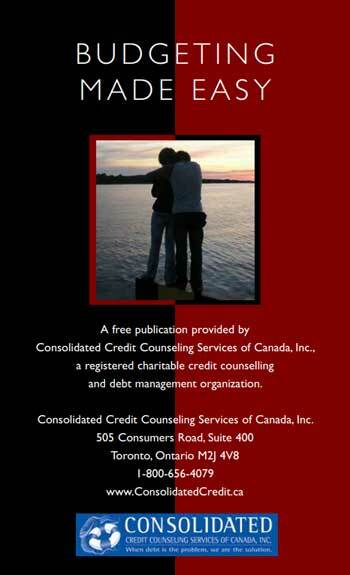 Call one of our trained credit counsellors at 1-888-294-3130 or check out our free online debt analysis. This publication teaches how to successfully manage money and avoid credit problems. This guide provides money management techniques that can put readers in control of their money and help them plan for a successful financial future. We have created this guide with two purposes in mind; first, to help people create and use a successful budget; second, to provide proven strategies for avoiding excess debt.